The 120 index wheel is the most versatile as it can do the standard 4,6 and 8 symmetry stones, but it also has the unique advantage of doing 5 and 10 sided stones as well. There is one disadvantage to this gear too, with so many teeth it is very easy to wrongly index a value and damage any particular design during the cutting process. Recently there are some theories that odd numbered gems are brighter than even numbered gems. So we have a gear divisible by 7 and 11. This gear simplifies the process for both 6 and 4 fold symmetry,, but if you already have a 96 gear it is redundant. The ideal gear for fast cutting of 4 fold symmetry gems. There indexes are well marked and few enough so that mistakes become far less common. An ideal gear for those in a hurry and who want to keep things simple. 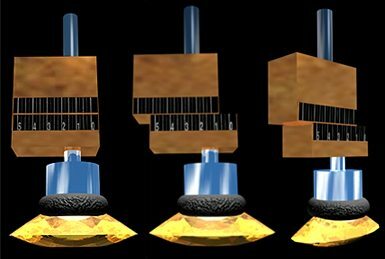 A 45 degree dop holder so the table of a gem can be polished without putting stress on the faceting machine head. Without this adapter, the head must be set to 0 (zero) degrees, or straight up and down to polish the table. This may be an awkward position for some faceting machines, hence there is usually a 45 degree adapter available. It is shown below. The offset adapter is used to cut elongated stones like the marquee cut. It provides a way to set the center of rotation off of the dop center. 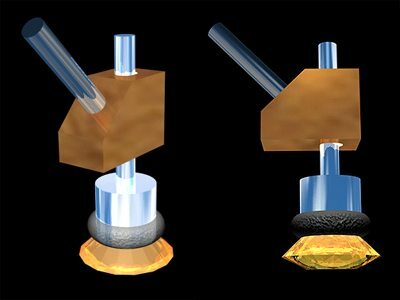 A locking base is provided than is graduated for return placement as needed, and the stones dop is placed on the base. The entire unit is mounted to the faceting machine on the top half of the block. As the base is moved, the doped stone move out of the center of rotation of the entire unit. It is shown below.